Clean animals are those that are permitted to be eaten by Jewish or Islamic dietary law. Food permitted by Mosaic law is termed kosher. The Biblical definitions and examples of clean animals are provided in Deuteronomy 14 . The most readily evident feature that distinguishes clean from unclean animals is their diet. The clean animals are all obligate herbivores (eating only plants), whereas the unclean animals are either carnivores or scavengers. The reasons for not allowing the consumption of the latter was only realized following the development of modern scientific investigation. Carnivores and scavengers frequently carry pathogens such as parasites, which are not found in herbivores. Some scavengers also accumulate toxins to levels that are dangerous to humans. Many contend that the Biblical definitions of clean and unclean is an example of the scientific foreknowledge that is found in the Bible. Cloven hooves possessed by Artiodactyls. 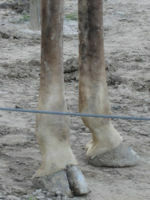 One group of clean animals are defined in Deuteronomy 14:6 as having a split hoof divided in two and that chews the cud. The text further clarifies that both the cloven hoof and cud chewing are requirements, and lists several animals (i.e. camel, rabbit, and pig), which have only one characteristic and are not permitted. Modern taxonomists place this group of clean animals in the order Artiodactyla (even-toed ungulates) and suborder Ruminantia (cud-chewing). The taxonomy of the Ruminants and a few examples are provided below. Improperly cooked meats pose a health risk because of the numerous pathogenic organisms they might contain. Only in modern times have technologies improved to the point where we can be assured that meats have been sufficiently cooked to kill these pathogens. Even today in societies where these methods are unavailable parasites are a major problem. Jane Cahill reported in Biblical Archaeological Review that the toilets of a Jewish household in Jerusalem were examined and no parasites or infectious agents were found. A similar study done regarding Egyptians systems revealed eggs from Schistosoma, Trichinella, wire worm and tapeworms, all found in pork. In addition to the aforementioned study testing kosher and non-kosher foods for toxicity levels, Macht had research indicating the harmful physiological effects of meat and milk combinations and he compared conventional animal slaughtering versus kosher slaughtering and determined that kosher slaughtering produced less toxic meat. Genesis 7:15 states that pairs of all creatures that have the breath of life in them came to Noah and entered the ark. Genesis 7:2-3 text also explicitly states that one pair of each unclean animal and seven pairs of each clean animal were brought on board to save them from the flood. It is most helpful that the Bible gives these specific descriptions regarding the animals spared from the flood. In doing so the Bible helps us understand the actual evolutionary history of animals, because we know the maximum number of species that were reintroduced from each created kind following the flood. Arguably, each breeding pair could represent a separate species, therefore, only one species was present on the ark from each unclean kind of animal, and up to seven species from each clean kind. With this information in hand, we then know exactly how many gene alleles or species have developed for each kind. It should be noted that many Christians believe they can eat the food that was declared unclean in the Old Testament if it is consecrated by prayer. Many Christians cite Peter's vision in Acts 10:10-15 as a divine degree to no longer classify many animals as unclean. However, in Acts 10:28-29 Peter provides the meaning of the above vision as being a declaration or instruction from God for the Jews to take the gospel message to the Gentiles, which Mosaic law defined as unclean. This page was last modified on 16 July 2012, at 20:31.